Few things excite the average pokies player more than seeing several wild symbols appear on the reels during a spin. Wild symbols were one of the earliest special features that started to appear on poker machines decades ago, but they’re still among the most popular: almost every pokie that has any bonus features at all will feature wild symbols. But what is a wild, and what makes them so popular? Keep reading to learn more about these ever present symbols. 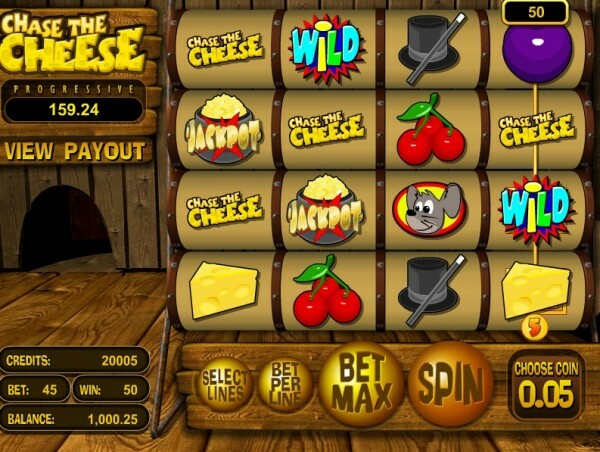 An example of a standard wild symbol in the BetSoft pokie "Chase the Cheese". The Wild symbol (quite obviously) reads "Wild". A wild symbol, also sometimes known as a substitute symbol, is one that can take the place of any other symbol in a winning combination. For instance, if you are playing a machine that uses sevens, bars, and bells as its prize winning symbols, and you need three in a row to win, a wild can partner with two of any of those symbols to make a win. Typically, any number of wilds can be used to form a winning payline. If our example pokie has three reels, two sevens and a wild would create a win, but so would a single seven along with two wilds. In fact, a payline comprised entirely of wilds is usually also a winner; this is sometimes the key to unlocking the biggest prize on a poker machine, such as a progressive jackpot. How Do Wild Symbols Help Players? Wild symbols make it much easier for players to score wins on any machine when they are present. Having a wild symbol on a reel is like having an additional version of every single prize-winning symbol there, since it can substitute for any and all of them. Wild symbols are especially valuable on games that have multiple paylines. On these pokies, a wild symbol will often substitute as a number of different symbols at the same time, making many wins on different lines simultaneously. This impact is even greater when multiple wilds appear on the same spin, as they might guarantee wins on dozens of paylines at once, leading to some truly massive payouts. These features help explain why wilds are often added to the reels during special bonus rounds on many pokies. For instance, some games offer the potential to turn one or more entire reels into wild symbols during a number of free spins. This can mean that players are guaranteed big wins on numerous (sometimes all) paylines, a situation that is rare and exciting even for experienced pokies players. Over time, pokies designers have come up with a number of different variations on the classic wild symbol. One simple way to make wilds even more lucrative is by combining them with multipliers; in these cases, a wild won’t just help create a winning combination, but will also multiply any wins that they are a part of. Other features are designed to improve the overall effectiveness of wild symbols. For instance, stacked wilds have several wilds lined up next to each other on each reel, making it possible to cover an entire reel in wilds if it stops at just the right spot. Also popular are expanding wilds, which can similarly cover an entire reel by “growing” to cover two or more positions once they land somewhere on the screen. Sticky wilds are wild symbols that will stay around for multiple spins, giving you more time to take advantage of them. Shifting wilds will see the wild symbols change positions during play over the course of several spins, offering you different opportunities to win using them. 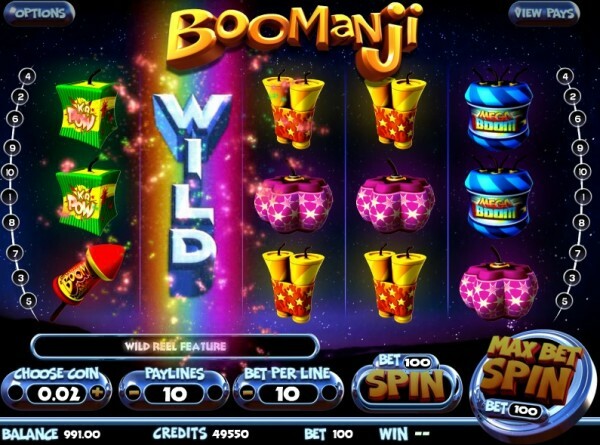 An example of an Expanding Wild is featured below in the BetSoft pokie "Boomanji". The Expanding Wild takes up the second reel. These are just a few of the many types of wild symbols that are currently available on modern online pokies. Poker machines manufacturers are constantly coming up with new and unique ways to make wilds work on their games, keeping one of the most popular special features in their products while still keeping them new and fresh. There is truly no limit to how wild symbols can be used in pokies these days. To check out the latest wild variants, head over to one of our reviewed online casino sites and pick out the poker machine of your choice: chances are, wild symbols will be a major part of the gameplay no matter which one you pick!